Brilliant actor-dancer-singer Jim Dale started out in the last days of British music hall. 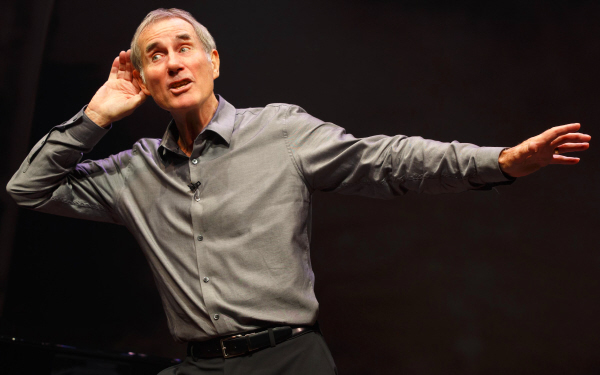 Just Jim Dale, his retrospective one man show, has the earthy yet somehow breezy quality of music hall at its best. In the show, Jim gives us only the most entertaining highlights of an amazingly diverse life in show business. From music hall he went to rock and roll singing and songwriting – he wrote the lyrics to the huge hit “Georgy Girl” – to film and stage acting, to doing hundreds of voices for all seven Harry Potter audiobooks. Just Jim Dale is very much a club act writ large, but having the full size of the Laura Pels stage certainly helps in his more dance oriented moments: at 78, Dale is still amazingly capable of the rubber-limbed “eccentric” dancing he learned as a young man. He’s best known in the Broadway world for his Tony-winning turn in the title role of Barnum, and indeed the songs he sings from that hit, “There’s a Sucker Born Ev’ry Minute” and “The Colors of My Life”, are the most effective and affecting of the evening. He also regales us with some less well-remembered shows, such as a very physical Scapino. Of the more dramatic parts of the evening, the most memorable moment is a monologue Dale does from Noël Coward’s Fumed Oak. It’s not clear whether his ever performed the play it’s excerpted from, but it’s so good that it really makes me want to see him take on more Coward roles. Dale, every the optimist and the entertainer, doesn’t dig terribly deep in this show. What he’s here to do – what he’s apparently always been here to do – is dazzle and get a laugh, and he does that more successfully than the great majority of performers out there. Highly recommended.